Earlier this season I caved and bought some grocery store strawberries, and they were horribly disappointing. No exaggeration, they tasted like nail polish remover smells. Ever since then I’ve been stalking my local strawberry patch on Facebook to see when the berries were ready, and this weekend they were! Aida and I took a relaxing drive out to the patch, windows down, radio on, and enjoyed the sweet smell of fresh strawberries all the way home. 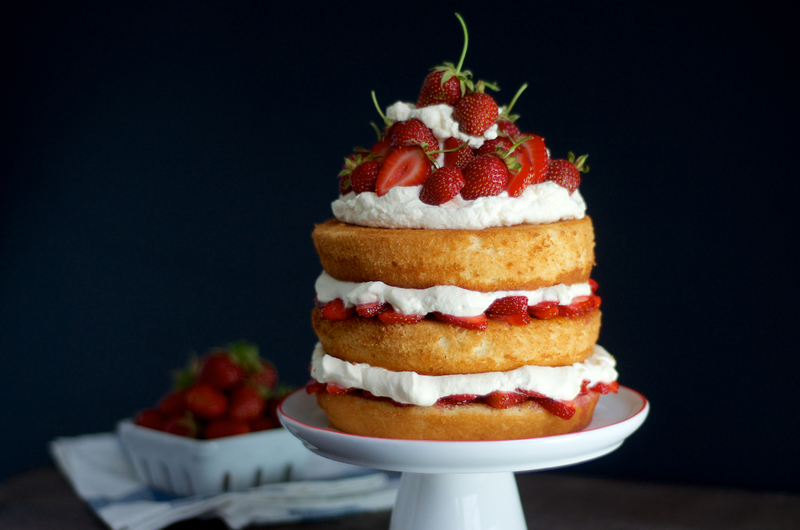 This lofty layer cake was nothing short of incredible. 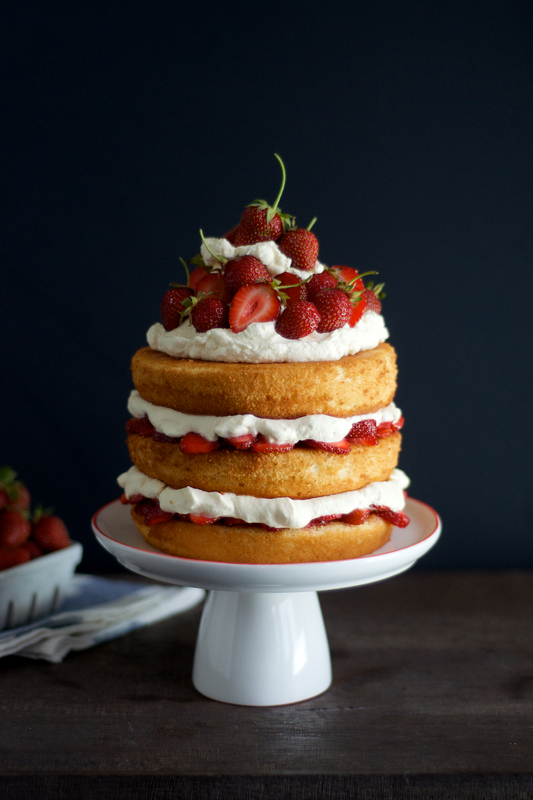 The cake was super tender, and moist, and complimented the fresh berries perfectly. I couldn’t track down the rosewater locally, but the cake was still awesome without it. Pre-heat the oven to 350 degrees F. Grease the bottoms and sides of three 6-inch round cake pans. Line the bottom with a round of parchment of waxed paper and then grease with butter. In a stand mixer fitted with paddle attachment or electric hand mixer, cream butter, sugar and vanilla until light and fluffy. Add eggs, one at a time, scraping down the sides of the bowl after each addition. Sift flour, baking powder and salt together. Add dry ingredients to the batter, alternating with buttermilk in 2 to 3 additions. When mixing, do not let the mixer exceed medium speed (unless using a low-power hand-held mixer). This will ensure that gluten does not form, and you have a soft airy cake. Divide patter evenly among three prepared cake pans. Bake cakes for 20 to 25 minutes, or until a toothpick inserted in center comes out clean. Let cakes cool in pans for 10 minutes; invert cakes onto wire racks, carefully peel off parchment and allow cakes to cool completely. Clean and hull strawberries, and slice into pieces about the thickness of a nickel. My berries were really small and compact in the pints, so I stopped slicing when I had about 1 1/2 to 2 cups of berries. Place sliced berries in a bowl and add sugar, rosewater and vanilla. Toss to coat, cover and let berries macerate at room temperature for about an hour. In a large chilled bowl, with chilled beaters, whip the cream and sugar until stiff. There will be about three cups. Place one layer on cake stand or serving plate, flat side up. Top with 3/4 cup of strawberry filling, spooning over the entire cake layer, and trying to keep juices from running on the plate. Top with one cup of whipped cream, spreading evenly over berries. Repeat with second layer of cake, 3/4 cup of berries, and 1 cup of whipped cream. Top with remaining layer of cake. Cover with last of the whipped cream and garnish with fresh, whole berries. For best flavor, cover the cake with dome or loose plastic wrap and refrigerate for about two hours before slicing and serving. Note: I reduced the strawberry filling slightly since I didn’t think the cake needed additional berries spooned over the cake for serving. If you’d like to serve extra sliced berries on the side, increase berries to 2 quarts, rosewater to 2 teaspoons, vanilla to 2 teaspoons and sugar to 1/2 cup. This cake is absolutely beautiful! I made this recipe YEARS ago so I know how delicious it tastes! Excellent job! Beautiful cake! Those strawberries look so sweet and delicious. I’m drooling. Heather! Your photo and recipe makes me want to go to the kitchen, post haste, and make this! I hear you loud and clear on store strawberries. I’ve been temped too, but I haven’t yielded. 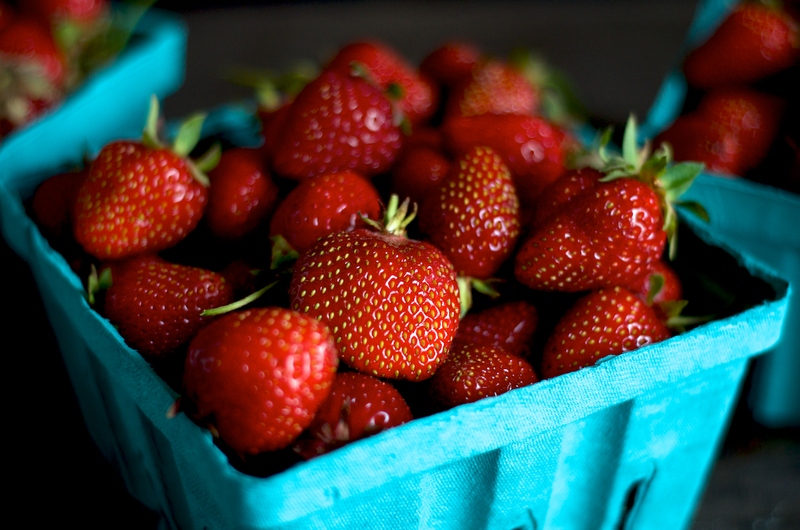 This past weekend I got a flat from my farmers market and made jam; it was first on the strawberry agenda! I think this will be #2! Thank you for the inspiration and recipe! Thanks! If you make it, let me know what you think. Strawberry jam is on my list for this weekend…we can’t live without homemade strawberry jam! I love strawberry jam and added red pepper to mine, loved the kick. Would you be able to freeze the layers? Hi Kelly! I don’t think that would be an issue. I wouldn’t freeze them more than a month, and be sure to unthaw before assembling.